The child, who has light-brown skin and hair worn in two afro-puffs, turns to Abuelo for help. He in turn “looks inside his heart for an answer.” Lyrical language and luminous illustrations convey his thoughtful response. “You’re from the gaucho, brave and strong.…But you’re also from the warm, blue oceans the copper warriors tried to tame…where our ancestors built a home for all, even when they were in chains because of the color of their skin.” By pointing out the child’s Argentinean and Puerto Rican cultural heritage as well as mixed racial makeup, Abuelo’s answer addresses the multilayered and varied possibilities of a Latinx identity. Ultimately, Abuelo points out, the questioning child comes from his love and that of all those who came before. The question of where someone is “really” from, in the United States, is too often understood as meaning: You look different; you must be from somewhere else. 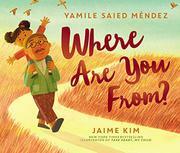 In this case, the illustrations portray a very diverse group of children and adults posing that very question, demonstrating the particular frustrations often experienced by people of mixed race.